The Pacific Coast Highway (PCH) stretches from southern California all the way to Washington, and runs along the beautiful Pacific Ocean. This means that your drive will mostly consist of the great ocean view. You will get to see a lot of state parks and cute beach towns on the way. There are a lot of other places that will come along the way such a Malibu, where you can watch the surfers surfing through the ocean, Santa Barbara, where you can see the whales, and the amazing landscape and scenic beauty of Big Sur. On this California route 1, you can enjoy spectacular views no matter which side of your car you are sitting on. On one side, you will get to witness humongous redwoods, while on the other side you will be welcomed by rocky beaches. For those of you who have not yet had a chance to travel on Route 66, you simply cannot miss this. It dates as far as the 1920s and is often referred to as the Mother Road or the Historic Route. Although no longer considered as the country’s official highway anymore, the route still has its value. It stretches from Chicago all the way to LA after passing through eight states. Many of the couples and road junkies are seen posing next to road signs on the route while on their trip, as they feel the Old West come to life. Arizona has even preserved sections from the original route which you will also get to see if you travel on it. The Blue Ridge Parkway is also known as America’s favorite drive, and runs from the Shenandoah National Park all the way to the Smoky Mountains situated in North Carolina. The drive will be a very scenic experience where you might also run into deer and black bears. You will get to see beautiful mountains and lush forests along the way, which will also give you plenty of camping and hiking opportunities. The drive will be consisting of no traffic lights, billboards, or trash, thus giving you the opportunity to experience the best experience that nature can give you. The Overseas Highway is the southern portion of route 1, and is considered to be a great route for a memorable road trip. On this route, you will be welcomed by the open ocean and you will get the opportunity to pass through a lot of islands situated within the Florida Keys. You will also get to see the very famous Seven Mille Bridge. Take some time out to snorkel in the Key Largo and also go to one of the many beaches that you will pass along the way. The entire purpose of a road trip is you view all the amazing sites possible and stop as much as possible to do so. The Volcano Highway, situated in Hawaii, is a must-do road trip. It will show you around the island’s various unique features, particularly the volcano Kilauea which is still active. The ring road circles the Hawaiian Islands and will take you through verdant valleys, lava deserts, and coffee plantations. You can also indulge in horse riding and kayaking. There are also various trekking opportunities on the island, especially the ones to the secret waterfalls. Sunsets and the nighttime are particularly attractive in the region, giving you the opportunity to see a sky full of stars. Road trips can simply leave you speechless because of so much beauty and amazing attractions that you get to see along the way. So what are you waiting for? Pack your bags, pick one out of these five road trips, and be on your way! 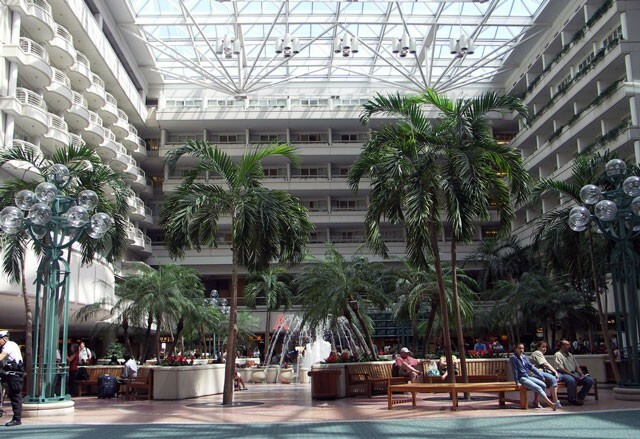 Orlando International Airport (IATA Code: MCO) serves Central Florida and popular destinations throughout Florida. The airport is one of the busiest in the region, providing a variety of shopping, dining, and sightseeing options from its two terminals. The airport provides access to a large number of domestic as well as international destinations. The airport is close to the Space Center as well as beaches and other amusements found in Orlando that include Disney World. The proximity to such amusements to the airport provide numerous entertainment and activities options for travelers. The airport serves over 30 million passengers a year with over 100 domestic as well as international destinations provided by 80 airline carriers. The original airport property was constructed during the Second World War as part of an Army airfield. Following the war the property was used for unpowered glide tests. During the Korean War, the air base was reactivated and in the 1950s served as a host for flight competitions. By the 1960s, the property became joint military and civilian, and was adapted to be accessible by jet airline services. The airport property became a forward operating base during the Cuban Missile Crisis of 1962. The airfield was taken over by the City of Orlando in the mid-1970s and renamed the Orlando International Airport in 1976, and has since served growing numbers of passenger traffic. Dozens of shopping and dining options await travelers arriving at Orlando International Airport. Such venues are located in the main terminal as well as in the satellite airside gate areas. Most shopping and dining options are available on Level 3 and include a variety of options at the food court such as Starbucks, McDonald’s, and Nathan’s Famous Hot Dogs. Sit-down restaurants include Macaroni Grill and Chili’s Too, both located south of the food court near the security checkpoint for Gates 1 through 59. Shopping options are found throughout terminal A and terminal B and include Magic of Disney, Borders Books, and GUESS. Additional services found on Level 3 include currency exchange, ATM machines, a post office drop box, Internet kiosks, and a walk-in medical clinic. Passengers can enjoy complimentary Wi-Fi services in all public areas. Over 15 off-airport car rental companies are also available in a variety of vehicle types. Free shuttle bus transportation to these car rental locations is available from the airport. Visit the Orlando International Airport for information regarding the off-airport rental services and access to those providers. For more information about Orlando international Airport, access their website at http://orlandoairports.net or call their general information number at 407-825-2001. The airport is located at One Jeff Fuqua Boulevard, Orlando, FL 32827. The United States of America is composed of 50 states. Over 300 million people call the United States of America their home. Bordered on the west by the Pacific Ocean and on the east by the Atlantic, the United States (including the islands of Hawaii and the state of Alaska), is a culturally diverse country known as the “melting pot” of the world. Since the colonial era and her gaining of independence in 1776, the United States has a reputation of being a global leader in military might, economics, social advancements, and human rights. The United States of America was founded in 1776 with the unification of the 13 original colonies declaring independence from England. After the American Revolutionary War, the newly united states adopted their Constitution and Bill of Rights guaranteeing fundamental freedoms and civil rights ratified in 1791. Following the American Revolution, the United States lived its manifest destiny, expanding her territories through the 1800s. During the War Between the States, the eradication of slavery and adoption of new laws and lifestyles formed societal expectations during the latter half of the century. Following the growth of military reputation and prowess during the First and Second World Wars, the United States today is a major influence on global politics, socio-economic growth, and a leader in freedom and human rights. English is the main language spoken in the United States, although heavy influences of immigration populations result in additional languages that include Spanish, German, Chinese, and French. Due to its racial diversity, additional languages spoken by more than one million people throughout the country also include Vietnamese, Korean, and Tagalog. The vast majority of Americans practice Christian religions including those of Roman Catholicism, Protestant, Lutheran, and evangelical denominations. The First Amendment guarantees freedom of religion, and non-Christian religions include Judaism, Islam, Hinduism, Buddhism, and others. Climate patterns throughout the United States depend on region. The northwest portion of the United States experiences mild, humid, and rainy weather, while southwestern states enjoy hot and dry desert environments. The Plains states enjoy relatively temperate climates in summer while winters often bring blizzards and below-zero temperatures. The Eastern states are hot and humid in summer. The Northeast experiences frigid and snowy temperatures in winter while the southeast enjoys moderate and relatively warm temperatures with rainy periods. The United States offers numerous geographical territories, landmarks, historical sites, and attractions. A few of the most popular tourism destinations in the US include attractions in the states of California, Florida, and New York. California offers Disneyland and Hollywood to the south and San Francisco’s Fisherman’s Wharf and Alcatraz prison to the north. Florida offers visitors a wide range of attractions and sites including the Everglades, Cape Canaveral, and several thousand miles of warm beaches. New York City and Washington, DC are also popular tourist destinations for domestic as well as international travelers. Washington, DC offers numerous landmarks and historical points to visit including the Smithsonian Institution museums, Arlington National Cemetery, the White House, the Washington and Lincoln monuments, and more. New York City offers Times Square, the new World One tower, replacing the twin towers destroyed in the September 11, 2001 terrorist attacks, Rockefeller Center, and the Statue of Liberty. Millions of travelers visit Las Vegas, Nevada every year to gamble and enjoy 24-hour excitement. Arizona offers the Grand Canyon, while South Dakota offers the beautiful vistas of the Black Hills and Mount Rushmore. Driving through any region of the United States offers a variety of scenery, landmarks, geography, and attractions. Car hire services are plentiful throughout the United States, with major car rental providers located in major as well as rural locations. Some of the most popular include Enterprise, Avis, Hertz, and National. When driving in the United States, travelers must provide a valid driver’s license. Be aware that most car rental agencies in the US won’t rent to anyone under the age of 25. It is recommended that any foreigner wishing to drive in the United States obtain car insurance from a rental car agency, and be able to produce an international driving permit along with a domestic driver’s license. Temporary car insurance is available for one to 28 days. Driving regulations for all 50 of the United States are fairly consistent, although some states have different speed limits, rules regarding cell phone usage, and blood-alcohol limits. The minimum age for legal driving in the United States is 16, but drivers under the age of 18 are not allowed to drive during certain times of the day or night. Seatbelt use is recommended for all passengers but is not mandatory in all states. Don’t drink and drive in the United States. It is prohibited everywhere, with a maximum blood alcohol content level of 0.8%. Make sure that you follow the rules of the road when driving in the United States to insure a pleasant, trouble-free, and enjoyable visit.